Denver Pet Partners (DPP) is a non-profit organization dedicated to advancing the Human-Animal Bond to improve quality of life, benefit human-animal interaction and enhance animal-assisted intervention (AAI) services in Colorado. Founded in 2001, DPP is inclusive of animal-assisted intervention (AAI) volunteers, professionals and associated organizations. To improve quality of life through animal-assisted interventions (AAI), respecting volunteers, clients, and our animal partners, and delivering excellence in our services. We insist upon ethical behavior in all things, inspiring trust by saying and doing what we mean and taking responsibility for our actions. We achieve together what none of us could do alone. We welcome a diverse membership and support one another. We listen to, support, and genuinely care about one another through a mutually-supportive environment. We always advocate for the safety and well-being of our fellow volunteers, animal partners, and clients. We are responsive and relevant to one another by continually investing in our members and by nurturing long-term, value-driven relationships with all with whom we collaborate. We are easy to do business with. The honor and credibility of a professional lies in their adherence to an exemplary code of ethics set forth as a guide to the members. The purpose of this code is far-reaching because exemplary professional conduct not only upholds honor and dignity, but also enlarges our sphere of usefulness, exults our social standards, and promotes the science we cultivate. Pet Partners’ Code of Ethics is intended to be used as a guide for promoting and maintaining the highest standards of ethical behavior. 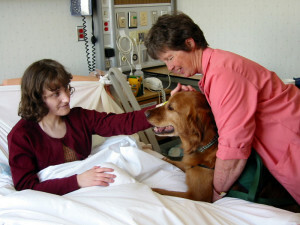 The code applies to all Animal-Assisted Therapy/Animal-Assisted Activities personnel, whether volunteer or professional. Acceptance of membership in Pet Partners implies adherence to these principles. Perform duties that are consistent with your position and training. Abide by the professional ethics of your profession and organizations. Demonstrate a belief in and attitude of reverence for all life. At all times, treat all animals, all people and the environment with respect, dignity and sensitivity, maintaining the quality of life and experience for all who are involved. Be informed and educated about the aspects and issues that are related to AAI. Demonstrate commitment, responsibility and honesty in all phases of your activities. Comply with all local, state and federal laws and Pet Partners policies that govern AAI.